Define the Question – You have to understand what the problem is before you can solve it. This is where you get clarity from your requestor as to what the issue is and why they want it solved. Create a “Core Idea” – The Core Idea is your recommendation. It is the action you want to take and the rationale for doing so. It’s a hypothesis as to what the recommendation could be combined with a reason for pursuing it. That reason must be something your audience values. Build the “Architecture” – The Architecture is the logic of your argument. It’s how you’re going to arrange your facts and analyses to support your Core Idea. Create the “Story” – The Story is a narrative that helps your audience arrive at your conclusion. It’s derived directly from your Architecture. Discuss and Refine the “Story” – This is where you begin involving other people and getting their feedback on your idea. Notice you’re involving others well before you expend a great deal of effort on conducting analysis. Select Core Facts and Analyses – This isn’t about having all the facts. It’s about having the right facts. The facts and analyses you choose to do will be gathered to support your Architecture. Prove or Disprove the Hypothesis – The analysis you do perform is done with the purpose of proving or disproving your hypothesis. This focus on required analysis is what makes the method efficient. Finalize the Communication – Whether you’re creating a presentation, a memo, an email, or any other document, you won’t assemble it until the final stages of the process. Fortunately by the time you reach this step, your entire document is already written. This step is simply an exercise in assembly. Share the Idea – Ultimately you need to share your idea with your stakeholders. Understanding their preferences for how they like to receive information will go a long way toward generating a successful communication that gets them to support your idea. 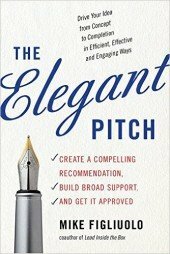 The Elegant Pitch will take you through every step of this process and help you craft more compelling recommendations. If you’re interested, we can come teach this method at your organization through our Structured Thought & Communications Course. Contact us to learn more.